Bring out the family and kiddos for Karaoke night. All songs must be family Friendly. The public is invited to enjoy Brews & BBQ at Grand Central Park, 715 Camp Strake Road in Conroe. 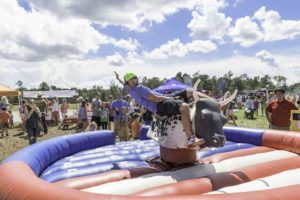 Free activities include a performance by the Joe Bailey Band, mechanical bull riding, pony rides, giant yard pong, Skee-Ball and inflatables. Guests can watch a private cook-off starring Montgomery County First Responders. Tickets for a catered barbecue lunch cost $10 and can be pre-purchased online or paid for with cash at the door. Alcohol also will be available for purchase. Proceeds go the Henry’s Home Horse & Human Sanctuary, which is located in Grand Central Park. For more information and tickets, visit https://www.grandcentralparktx.com/brews-and-bbq. The Edge Restaurant and Bar. Map The Edge Restaurant and Bar. Come out and see Motown Brought back to life with the sounds of The Two Black Guys. Bring out the kiddos and sing us a song. All kids dine for .99 with the purchase of an adult entrée.